Watch as owners Tony and Renee Gebauer create attractive, affordable, and functional pottery on site in their working studio and gallery on Main Street in downtown Fish Creek. 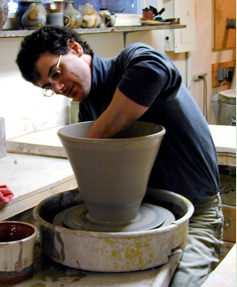 Their work focuses on traditional forms: pitchers, bowls, mugs, platters, vases, and many other shapes. The tableware is fired to stoneware temperatures for durability, and the glazes are food safe. Pieces can be used in an oven, microwave and dishwasher. Also featured in the gallery are one-of-a-kind wood-fired pots. Most Saturdays or by appt.